We will start with the front. 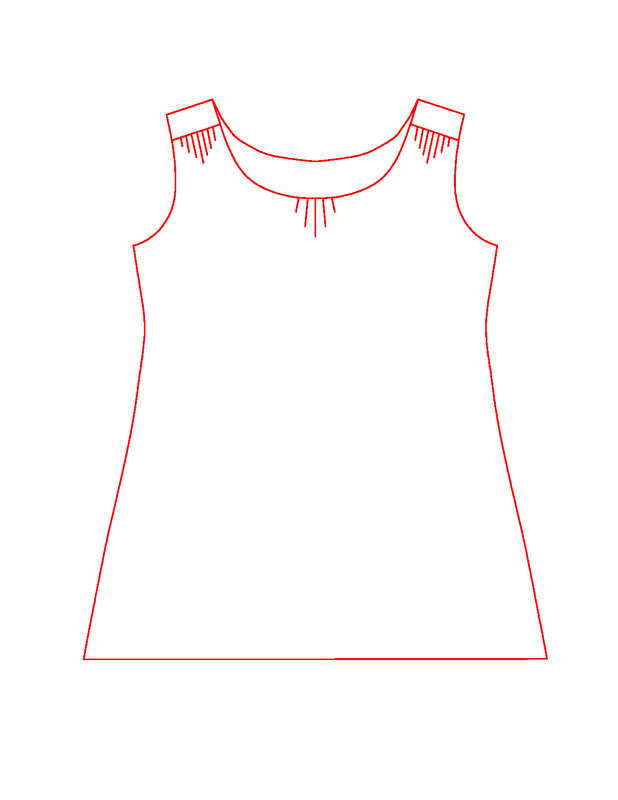 First, redraw the neckline. I measured 4 cm from the neck on the shoulder seam and 9 cm down the midline. These numbers are arbitrary and you can choose your own... This time, I want the shoulder to be a bit wider than on the Ulla top, so I took just 1.5 cm off from the arm opening. Since this is another wide/deep neckline, I will tighten it as well. 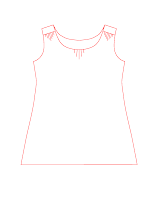 It is the same as for Ulla top last week: draw a line from the Bust Point (BP) to the new neckline at about 1/3 of the length of the neckline from the midline. Then measure 0.5 cm down, toward the midline and draw another line to BP. These two lines form a small "dart" that we'll cut out and close. Redraw the arm opening. You could have done it in the previous step. I just forgot. 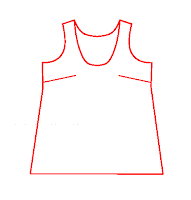 Cut out the new neckline, arm opening, the bust dart and the new "dart" at the neckline. Remember to cut the dart to, but not through the BP. You don't want the two pieces of the pattern to separate. 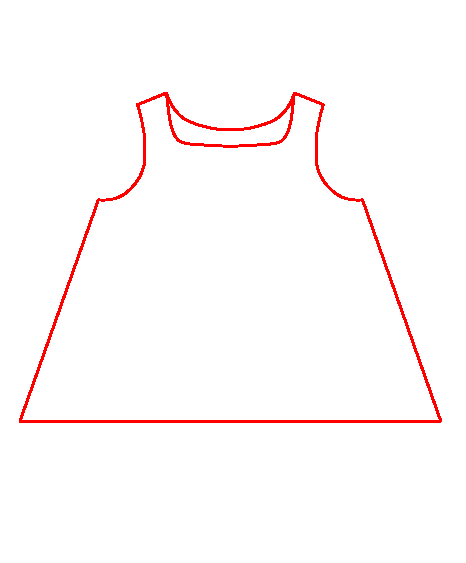 Now move the smaller part of the pattern to the right, until you close the neckline "dart". Tape together. We just moved the neckline dart into the bust dart. This tightens the neckline, and widens the bust dart. Fix (smooth) the neck curve if needed. Now the back... Reshape the neckline first. 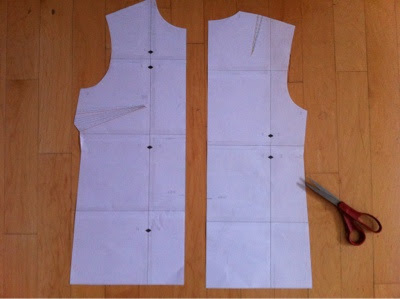 Move the neck point 4 cm down the shoulder seam, and deepen the neck opening by 5 cm (or choose your own values). Now the dart... We will move it into the hemline, same as for the Ulla top. So, draw a line straight down from the tip of the shoulder dart to the hemline. Cut along that line to, but not through the tip. Cut out the shoulder dart. Put some paper under the pattern, and close the shoulder dart as you wish... depending on how much flare you want to add along the hemline. This time I opened it about 3cm (measured at the hemline). I will simply ignore the remaining shoulder dart and blend it in the design. Tape to the paper below to secure and cut out. Next, align the front and the back, such that neck openings match. Tape together. Redraw the back arm opening and fix the neck curves, if they are not smooth across the shoulder seam. Then draw a line 5 cm away from the neck seam line, parallel to the seam line, on the front pattern. This will be the "yoke". It's not really a yoke, since it will be a part of the back pattern, but I don't know what else to call it. Cut along that line. Back to the front pattern. 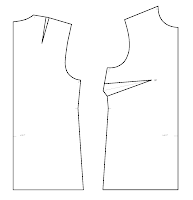 Now we will move the bust dart into the shoulder seam (the new shoulder seam or the "yoke") to get the gathers. (I did the same thing in week 6) So... draw a line from BP to the middle of the shoulder seam (point 1) and then measure about 1.5 cm on each side of 1 to mark points 2 and 3. I placed * marks about 1 cm away from points 2 and 3 - you will be gathering between those points. Cut along the lines from 1, 2 and 3 to BP (but not through). Now place some paper under the shoulder part of the pattern and close and tape the bust dart. Fan out the cut out pieces evenly and tape to the paper below. 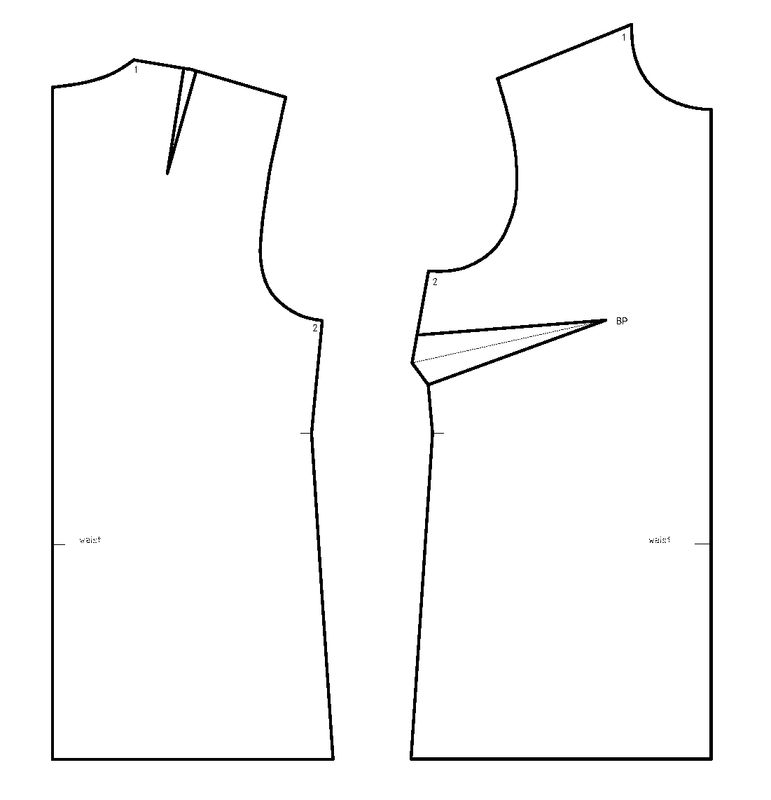 Reshape the shoulder seam and cut out. And now for the front gathers... We need to add some width at the midline. Mark * at the desired distance from the midline. Make sure that it is on the flat part of the curve, otherwise your neckline might not keep shape after gathering. In my case, * is 2 cm away from the midline. I will add 3 cm to the width - in other words move the midline 3 cm to the right. I was a little lazy, and did not actually add it to the pattern. I will add it when I cut the fabric - I will simply move the "old" midline 3 cm away from the fabric fold. And that's it. This is what front and back look after all the modifications (well, except the added width in the front). I just noticed I will have to smooth the arm curve on the back a bit more.. it's not smooth across the original shoulder seam.